The Sun's Death event (as it is called by the Khajiit, also known as the Year of Sun's-Death or the Year of Winter in Summer to the Nords) took place in 1E 668, coinciding with the beginning of (or the end of, according to some tales) the War of the First Council. The event was caused by the first major eruption of Red Mountain, which filled the sky with sulphurous ash for an entire year and reshaped the island of Vvardenfell. Various religious interpretations of the event exist. Some believe that the Orcish god Mauloch filled the sky with his hatred after his defeat at the Battle of Dragon Wall circa 1E 660. Those in Shornhelm claim that the event was only ended due to the Purge of the Wyrd-Hags, which is said to have restored Magnus to the sky. The War of the First Council ended thirty-two years later at the Battle of Red Mountain in 1E 700, and resulted in the disappearance of the Dwemer, the creation of the Tribunal, and the Chimer being cursed by Azura to become the ashen-skinned Dunmer. Azura also foretold of the Nerevarine Prophecy at the conclusion of the war. Regardless of the metaphysical significance of the event, Sun's Death had a real and measurable effect on the climate of Tamriel. The modern Nirnroot plant emerged as a result of the lack of sunlight, which caused the plant to adapt to the use of falling ash salts for nourishment. This allowed the plant to avoid extinction, although over time the amount of ash content in the soil diminished. 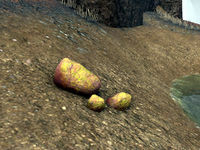 During the Second Era, volcanic tuffs from Red Mountain could still be seen along the banks of Lake Rumare, but by the late Third Era the ash content of Cyrodiil's soils had diminished to such an extent as to threaten the Nirnroot with extinction. Another eruption event, the Red Year of 4E 5, coincided with the conclusion of the Nerevarine Prophecy and the falling of Baar Dau.